The “Rebuilt” priest, Michael White, has stirred a nest of hornets in his opinion that parents aren’t encouraged to bring little children to Mass. It’s a reasonable notion. It’s also not the only notion. In his book, he cites testimony from parents who are relieved to have the experience of child-free worship. And they’re speaking their own children. Sometimes kids can be a handful–even one child (and on that point I speak with experience). If a couple can only get away for one experience together, and if their kids require more than minimal attention, then I would affirm Fr White’s position. If parents can’t root themselves in a worship experience, how could we expect them to be fed and nourished for their spiritual duties to each other and to their children in the coming week? That said, I could imagine two parents who pray together at least once a day, and who engage their children in prayer. Same parents also bring their kids to church at times other than Sunday Mass and accustom the young ones to quiet. Even if those girls and boys at Sunday Mass started crawling all over the woodwork, I can see a prudent choice in favor of bringing them to Mass. There’s a bottom line: it all depends. I also read Prof. Tim O’Malley’s critique. I largely agree with it also. He has a deeper grasp of the theology of Mass than Fr White. His arguments in favor of the spiritual imagination of children are persuasive. If people in a parish are distracted by little kids, my advice there: get over it. Catholic bloggers who are deacons, educators, and homeschoolers, critical of Fr White, likewise. It’s just advice. Not a standing order. Fr White’s critics all have more tools, resources, and experience at their disposal than “Timonium Tim,” the typical suburban American quasi-MTD seeker that Fr White is just trying to get into the building more than once or twice a year. Parents who find children more a burden at Mass need mentors, not theology or a blanket we’re-okay/they’re okay. My guess is that’s Rebuilt 201. This entry was posted in Liturgy and tagged children in church, Rebuilt. Bookmark the permalink. I’m with you. 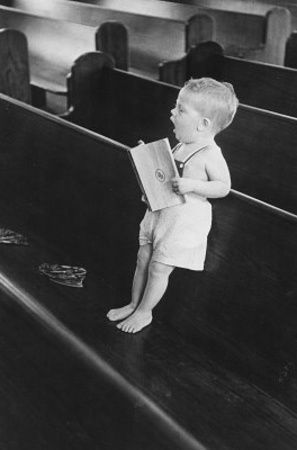 Parents who want to be at Mass without their toddlers should not be made to feel guilty about it. Likewise, parents who do want to be at Mass with their toddlers should not be made to feel guilty about it. The only ones who should feel guilty are those (including priests) who give either sort of parent the stink eye for the choice they make in this regard.